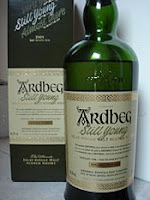 The Ardbeg distillery produces some of the world's smokiest scotch whiskies. It is located on the island of Islay and was founded in 1815. Ardbeg has been closed down on a couple of occasions only to be reopened by new owners. The last closure was in July 1996. Production restarted in June 1997 after a takeover by the Glenmorangie PLC (who are in turn are now owned by drinks giant Moet Hennessy). This 'Still Young' bottling forms the second part of a progressive four part series of whiskies to celebrate this re-opening. In each case, the whisky was distilled in 1998 but then released at different ages. 'Very Young' was bottled at seven years old and released in 2005, 'Still Young' at eight years of age in 2006, 'Almost There' at nine years of age in 2007 and finally 'Renaissance' at 10 years old in 2008. Ardbeg also has a reputation as one of the world's most innovative distilleries - not only for their whisky, but also for their unique marketing, branding and advertising style. Their website http://www.ardbeg.com/ is worth a visit. This whisky is a light golden colour with a nose that is extremely smoky and powerful. Some of this power is coming from the alcohol strength (56.2% ABV) and its youthfulness. With many young whiskies the alcoholic blast overpowers everything and this mellows with increased maturation. The alcohol here is not overpowering but is a factor with the nose being very smoky and earthy (think of coal smoke and damp moss). There is a nice, almost sugary sweetness as well (imagine caramel) and something herbal (think of freshly cut grass). On the palate, this is quite creamy and full bodied with a lovely mix of toffee, vanilla, sweet malted barley, that grassy herbal note and just a hint of some spiciness (imagine ground white pepper). This is all complimented by the bold earthy, peaty smokiness. With a touch of water, it becomes creamier and the herbal note becomes bolder. The smokiness fades slightly but is still the main and boldest feature of the whisky. The finish is very long with the smoke smouldering away for ages and a salty tang appearing right at the end. An extremely good dram and an excellent example of a young yet balanced smoky whisky. Bottles are now scarce, as it was a limited release, but can be found on the internet for £60-70 (it sold for around £40 when first released).